Biking the Mt. 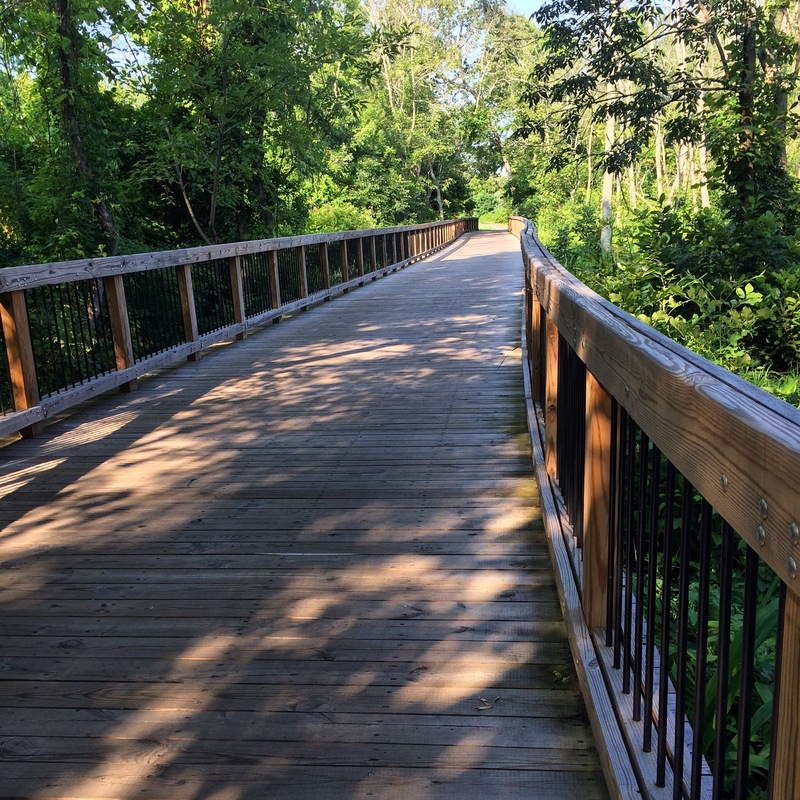 Vernon Trail – WeLove2Bike! I have been traveling to the Washington, DC area every year for almost 20 years. In my day job, I’m a mild-mannered patent attorney, and the DC area is home to the United States Patent & Trademark Office, as well as the headquarters of the premier professional organization for patent geeks, the American Intellectual Property Law Association (AIPLA). I have visited several times a year for the past three years, while serving on the Board of Directors of AIPLA. Many of the Board meetings are held in Crystal City, and I have enjoyed staying in different places (downtown DC, Arlington, Alexandria) and using Capital Bikeshare to get to the meetings. Those trips have almost always taken me onto the Mt. Vernon Bike Trail, which passes right through Crystal City. It was starting to bug me that I’d biked on the Mt. Vernon Trail several times, yet hadn’t once come close to exploring Mt. Vernon. With the realization that this summer’s board meeting would be my last one at the Crystal City location, I just had to work in a trip to Mt. Vernon. View of the Washington Monument from the bike trail on the Virginia side of the Potomac. This was taken in March, while commuting from the Rosslyn area to Crystal City. This time I stayed with my friend, Debbie, who lives in Alexandria. I flew in on a red eye flight, took a nap at Debbie’s, tended to some work matters, and devoted my afternoon to the bike adventure. Debbie was kind enough to loan me her bike and point me in the right direction. Of course, rather than simply follow Debbie’s guidance, I entered my destination into google maps on my phone, and figured the app would keep me from losing my way. How wrong I was about that! After struggling a bit to climb a steep hill in Debbie’s neighborhood using an unfamiliar bike, it dawned on me that I may have gone right where Debbie had told me to go left. Having just climbed that hill, though, I decided to just take the google route. Then I realized the streets it was taking me on were not exactly bike-friendly. I double-checked my google maps settings, and realized that I had it on the automobile setting instead of the bike setting. oops. I changed the settings to bike mode, and took a good look at where I was on the map. Instead of going through Alexandria to the intended bike trail, Google had me heading south on a more direct route. Although I occasionally found myself on a road much too busy to be comfortable on a bicycle, I went with it, just to see where it took me and to embrace the adventure. Once I turned off of the busy road onto the “Old Mt. Vernon Highway”, I felt reassured. Aftter all the frequent stops to be sure I was on the correct road, and occasionally to back-track after making a wrong turn, the actual arrival at Mt. Vernon was a welcome relief! 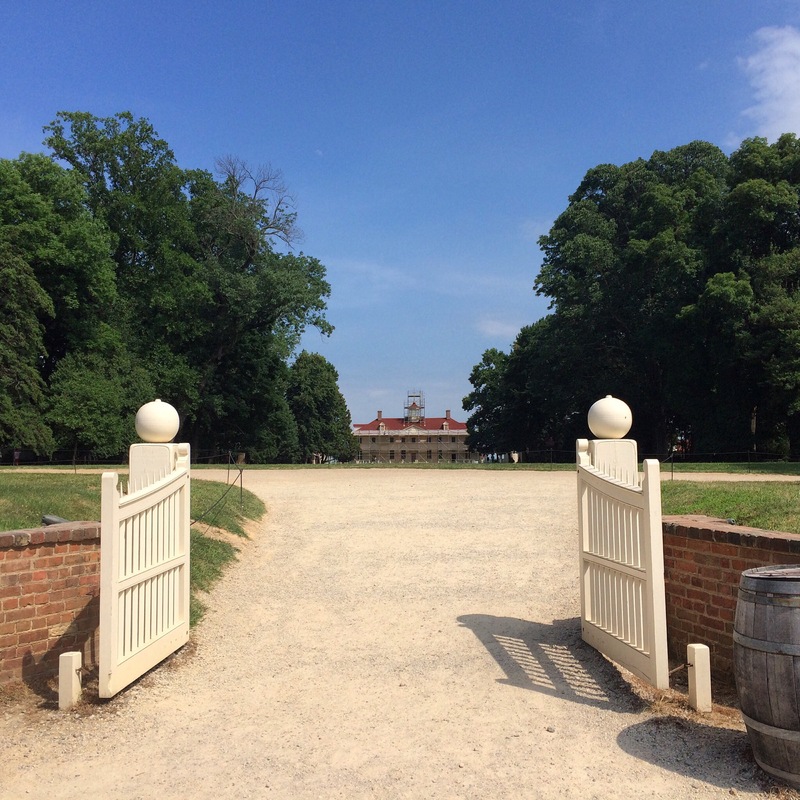 Arrival at Mt Vernon – a beautiful garden in front of the restaurant. There is a large, circular drive near the front entrance. After snapping the above bike portrait, I looked for the bike parking sure to be available at a large attraction at the end of a bike trail. When I finally found the bike parking, I was underwhelmed. It was one of those little bike racks that seems designed to only allow you to lock the front wheel. 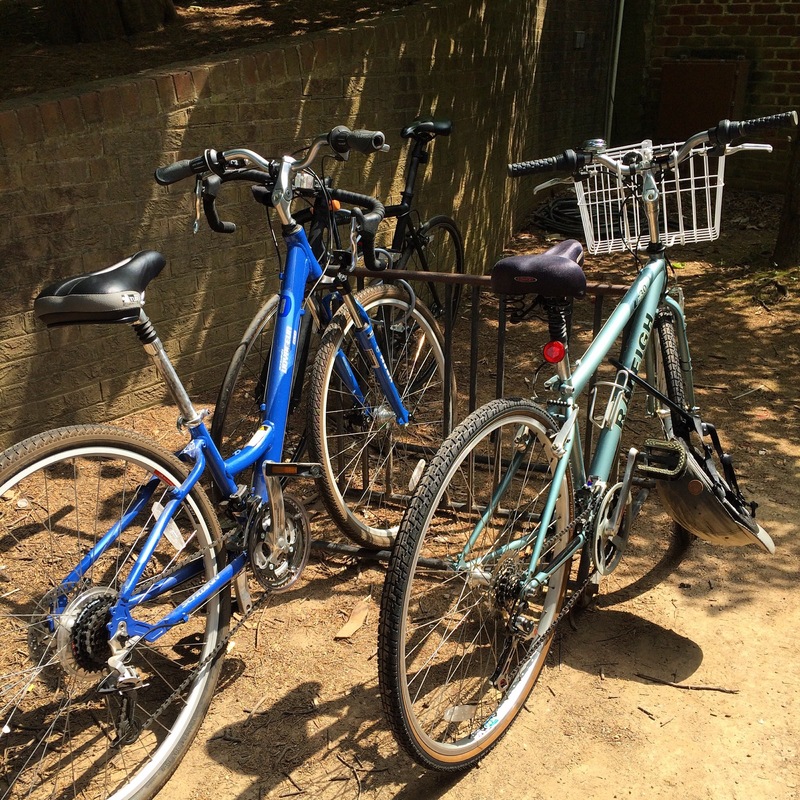 Surprisingly lame bike parking for a popular attraction positioned on a well-known bike trail. It was a hot day, and I was grateful for the blast of air conditioning that greeted me upon initial arrival. Soon I realized that this was only going to be available at the beginning and end of my visit. The Mt. Vernon estate is humongous, and I had to walk from site to site in the hot sun. I carried my water bottle and filled it at every drinking fountain. Grand entrance to George & Martha’s crib. I was lucky to arrive just in time for the last tour of the mansion for that day. That back porch faces this view of the Potomac. 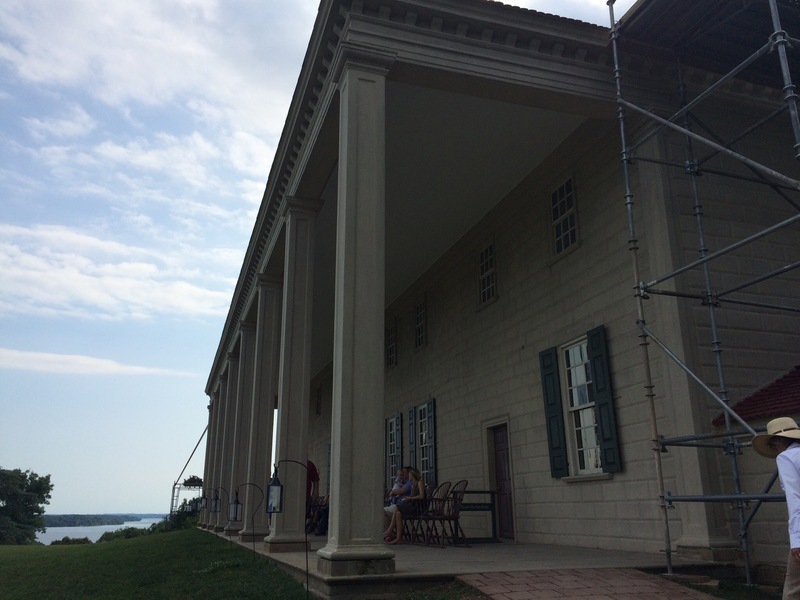 I only took a few pictures of the mansion, but I checked out the outbuildings, the slaves quarters, the gardens, the slave memorial, and walked about as much of the grounds as I could handle for a hot afternoon. Then I stopped at the air conditioned tourist building for a snack before getting back on the bike and heading for that trail. One of many pretty wooden bridges along the Mt. Vernon Trail. I was so grateful for the shade and the beauty of the Mt. Vernon Trail, especially after having had my fill of the hot sun. It was also a wonderful relief to not have to worry about car traffic beyond a few places where the trail intersects with regular roads. 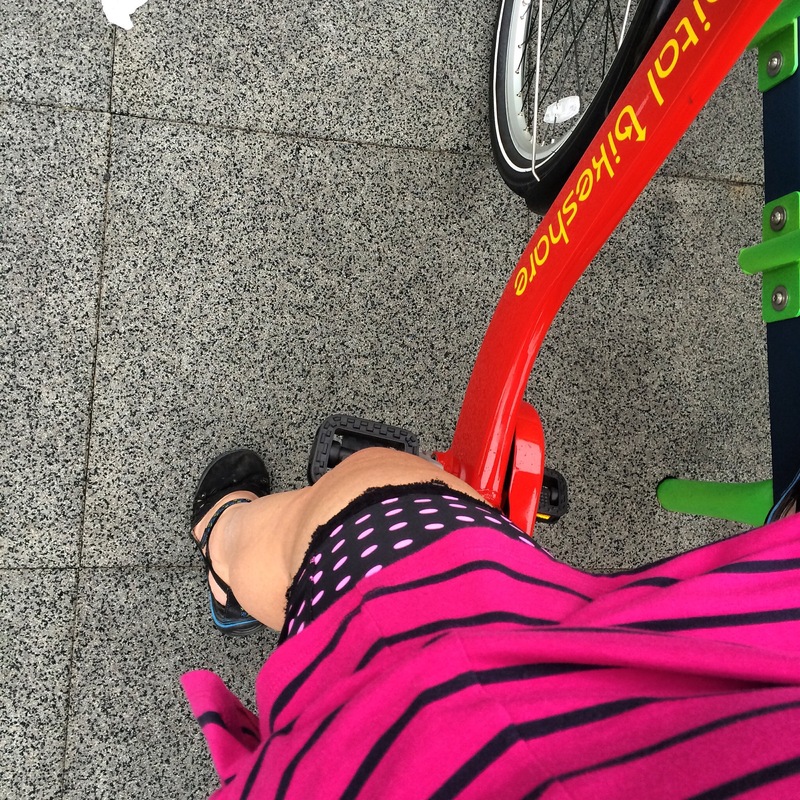 Style shot: sporting my pink zebra bloomers under the Hitchable Flounce Skirt. Of course, I wore a fun pair of bloomers for the excursion. Sizzling hot zebra stripes for a sizzling hot day. 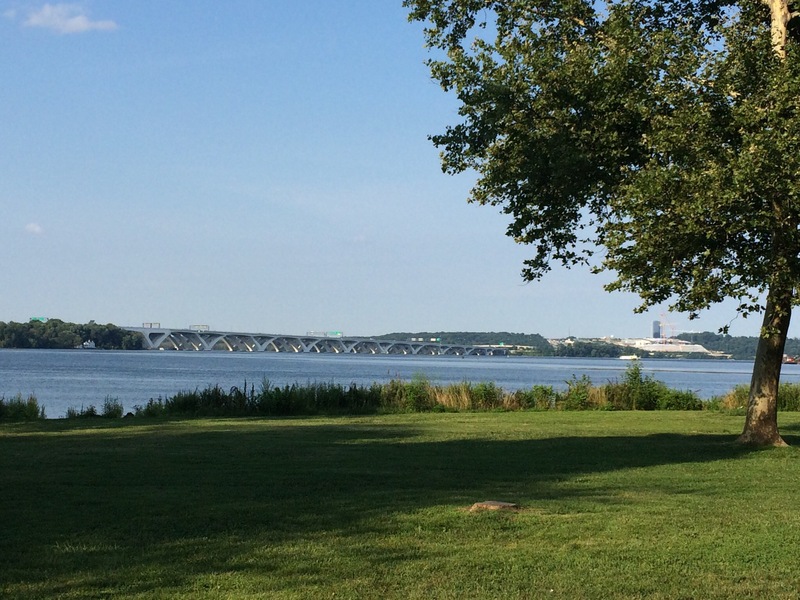 View of the Woodrow Wilson Bridge over the Potomac. To ride along the Potomac River, over cute bridges and through pretty trees for such an extended stretch was wonderful. The only bummer was what seemed like a long slog to get through Alexandria and complete my return to Debbie’s house. Although my total trip was just a bit over 25 miles, I felt pretty spent by the time I made it back. I was glad, though, that my mistaken start had resulted in a nice loop. That’s always more fun than a simple out-and-back route. My complete route: 25.4 miles. 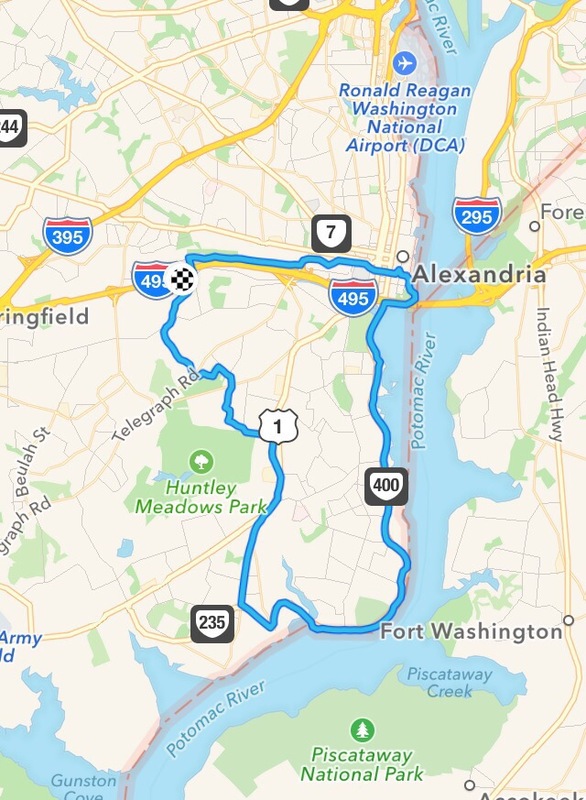 The following morning, I needed to get from Alexandria to Crystal City for my Board meeting, and then from there on to the airport for my return trip. Debbie dropped me and my luggage off near the King Street station, and I had fun figuring out how to secure my luggage onto a Captial Bikeshare bike. Luckily, my luggage for this short trip consisted of a tote bag and my briefcase. I don’t think I could get a suitcase of any kind on one of those bikeshare bikes. On a normal day, I could have just hopped on Metro with my bags, and taken the yellow or blue line a couple of stops to Crystal City. But this was not a normal day. Metro had shut down part of that route for some critical maintenance work. 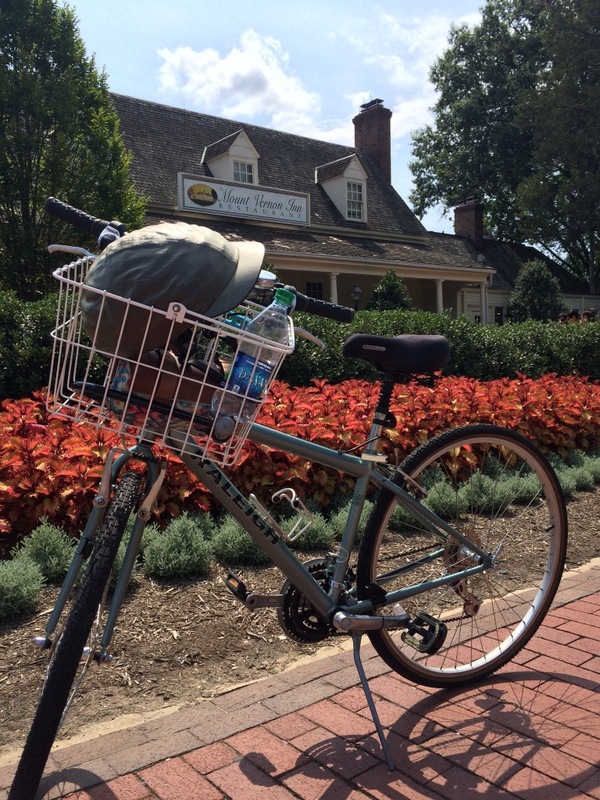 But I didn’t mind – it was an excuse to explore another bike path! Balancing my luggage on the bike share was a little tricky. I found what looked to be a fairly new bike path, the Potomac Yard Bike Trail, which featured some work-out stations along the way. 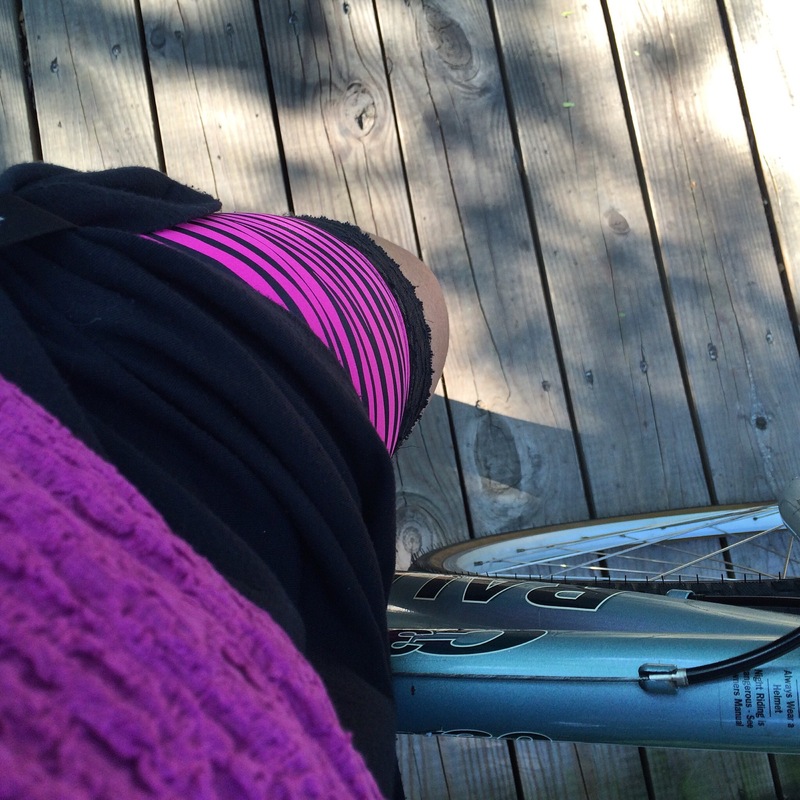 Style shot: one of my favorite combos is the pinka dot bloomers under my pink & black striped dress. The dress code for my Board meeting was, thankfully, “business casual”. I decided my comfortable pink & black striped knit dress was reasonable, especially given the warm weather. And I love pairing that dress with my Pinka Dot Black Bloomers. 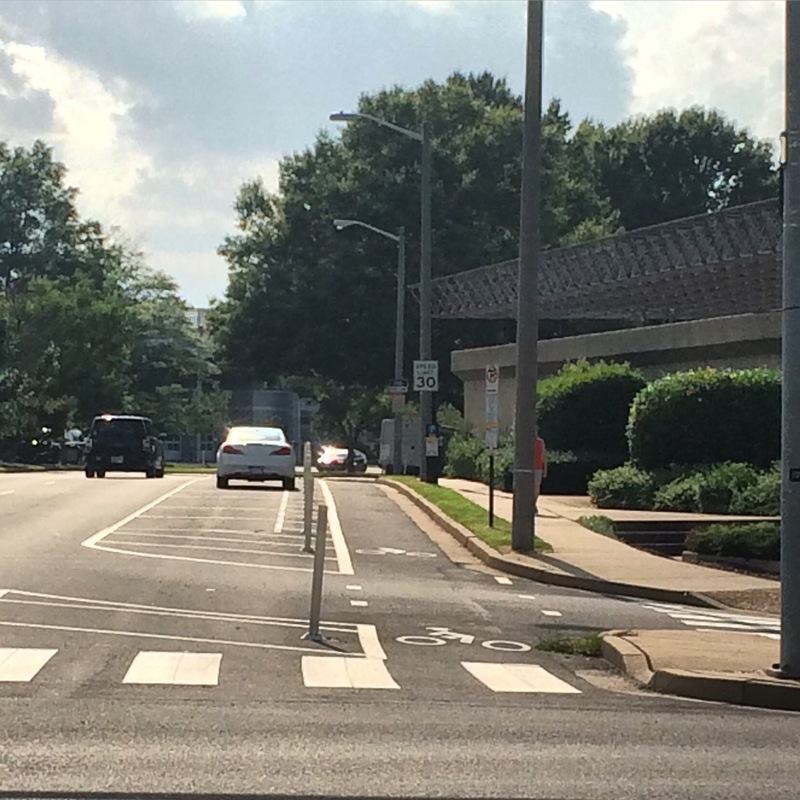 Nice protected bike lane for much of my one-mile ride to get from Crystal City to Pentagon City. Once the meeting was over, I needed to make my way to BWI, the Baltimore airport. With the Crystal City Metro Station closed, I first had to get to the next stop, Pentagon City, about a mile away. 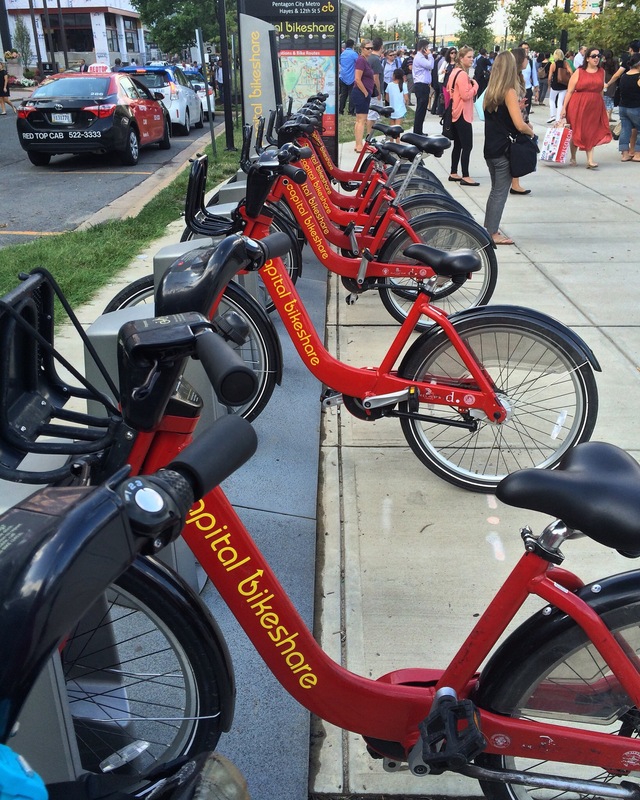 Capital Bikeshare to the rescue! This was also a fun treat, as I had not biked in that direction before, and was pleasantly surprised by the quality bike lanes available for most of that trip. Bike station at Pentagon City Metro. It was rather satisfying to pull up to the bike dock in front of the huge crowd waiting for Metro shuttle buses when I got to Pentagon City. 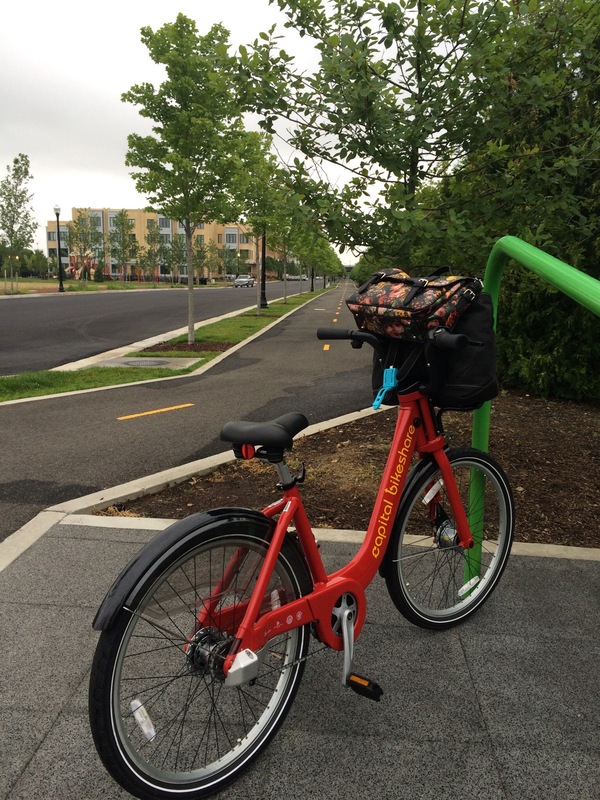 Using bikeshare to get around the Metro closures was definitely more convenient. From Pentagon City, I took Metro to Union Station, where I caught the MARC train to BWI. All in all, a delightfully successful bike adventure! ← Los Angeles Gets Bike Share!